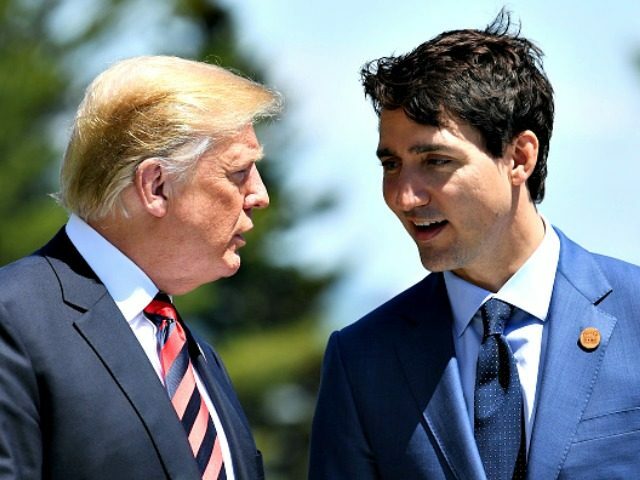 President Donald Trump unloaded on Canadian prime minister Justin Trudeau Saturday for remarks the G7 summit host made on trade, announcing the U.S. will not endorse the communique signed by the seven largest advanced economies in the world. “Based on Justin’s false statements at his news conference, and the fact that Canada is charging massive Tariffs to our U.S. farmers, workers and companies, I have instructed our U.S. Reps not to endorse the Communique as we look at Tariffs on automobiles flooding the U.S. Market!” Trump tweeted. President Trump was responding to Trudeau’s remarks on trade between the U.S. and Canada, in which the prime minister warned his government would take retaliatory measures if new tariffs were introduced. “And I highlighted it was not helping in our renegotiation of NAFTA and that it would be with regret but it would be with absolute certainty and firmness that we move forward with retaliatory measures on 1 July – applying equivalent tariffs to the ones that the Americans have unjustly applied to us,” Trudeau continued. Next Next post: Does Melania Believe Stormy Daniels Or The President? Here’s Her Cryptic Statement.